When you implement a year-round fundraising program, you allow supporters to turn any of their life events into an opportunity to fundraise for your cause. And while it’s common for people to set up personal fundraising pages for their birthdays, there’s another big occasion they can leverage for a good cause: their wedding. Every year, 2,077,000 couples get married in the United States. Yet, as an increasing number of millennials are getting married later in life, there isn’t as much of a need for “stocking their house” with registry items, since they’re already more established than younger couples. As such, many appreciate cash gifts so they can dedicate the funds as they see fit—to their honeymoon, or specific investments, like your cause. To help you ask your supporters to leverage their special day for your mission, we’ve outlined eight creative ideas you can pass on to your community. Review the possibilities and then read through the tips for how to craft your appeals. Traditionally, wedding guests receive a small token of appreciation from the bride and groom as a thank you for attending. Popular choices include personalized glassware and chocolates. Instead of handing out an etched glass soon to be forgotten in the back of a cabinet, your supporters can give their guests a gift that truly has an impact. Suggest that supporters let their guests know a donation has been made in their names for attending their special day. Another idea is to have guests choose a cause close to their own hearts. The bride and groom might set up a table at the reception that presents the option to select one of three charities, which the couple will ultimately donate to. When it comes time to plan a wedding, one of the first decisions is the budget. Once an overall budget is determined, the bride and groom then typically establish their priorities. To make their special day even more meaningful, the bride and groom can elect to cut costs in an area or two and donate a portion of their overall budget to your cause instead. The average cost of a wedding dress is $1,357. They also cost $250 to $700 to preserve in order to prevent deterioration and discoloration over the years if brides choose to store it. If a bride chooses to sell their dress, they tend to sell for 40 to 60 percent off the original price. A $1,300 dress, resold for 60 percent off, would go for $520. If you give your supporters the option, that’s $520 that could support your work instead of sit in a closet. For couples who already feel well-established in their homes, creating a fundraising page instead of a registry page is a great option. After they set up and personalize their page to reflect their story, they can circulate the link to their page just as they would their registry. Information can be included in their invitations, and link out from their wedding website. Another idea is to livestream the fundraising page at the wedding reception at the “card table.” The bride and groom could speak to their decision at the event and encourage anyone who hasn’t made a donation yet to consider giving right then and there on their phones. Some wedding website hosts, like The Knot, work with nonprofits to give a portion of the proceeds made through registry purchases on their site to charity. The Knot currently works with a list of over 100 nonprofits. Encourage your supporters to consider your nonprofit during opportunities like this when available. Wedding events also tend to have a gift table for guests who bring a card or gift the day of the event. Anyone wishing to contribute a cash gift typically does so in a card at the reception. Ask your supporters to consider making a donation in the amount they receive from their generous guests. As gifts given at the bridal shower also tend to be chosen off a registry of curated home goods, donating the bridal shower is a great way to soften the ask from your supporters. Rather than forego all of their wedding gifts, they can simply pass on the shower gifts. The Knot advises wedding guests to spend 20 percent of their gift budget on the shower gift. In the same article, they point out that the shower is the only event where a gift is required. This could prove a very lucrative and less sacrificial way to donate to your work. Here at Classy, we know the power of a pub-crawl for good. In fact, it’s how we got started. The bride and groom can each leverage their respective celebrations and ask their wedding party members to join them in raising money for a good cause. Each member can create their own unique fundraising page, and work to raise a certain amount leading up to the event. Weddings are once-in-a-lifetime events. And while many traditions have endured over the years, younger generations are getting more creative than ever when it comes to how their day reflects them as a couple. So while asking someone to donate one of the most important days in their lives to your work might feel intimidating, know that with the right approach, you’re simply offering an option that many will feel honored to participate in. After you add language to your website or fundraising page that advertises the option to dedicate a life event, you’ll want to target specific groups of supporters to contact. One group might be your community of recurring supporters. This group has demonstrated their dedication to your work, so messaging of this nature is more likely to resonate with them. A second group to target would be your younger supporters. If you collect birthday data for birthday fundraising outreach, you can use that information to determine a target send group. The average age of marriage in the U.S. is 27 for women and 29 for men, though this number can vary considerably state by state. After you think through who you want to ask, work through how you’ll present the opportunity. You can have your ask live on your year-round fundraising page. True Colors Fund presents the option to fundraise for “True Love” alongside their other DIY options. When a supporter clicks through to the True Love page, they’re greeted by a playful meme and suggestions for many different ways to dedicate their love to the cause. To drive traffic to your year-round fundraising program throughout the year, identify spots in your calendar year when you might naturally spotlight this support option in your marketing efforts. 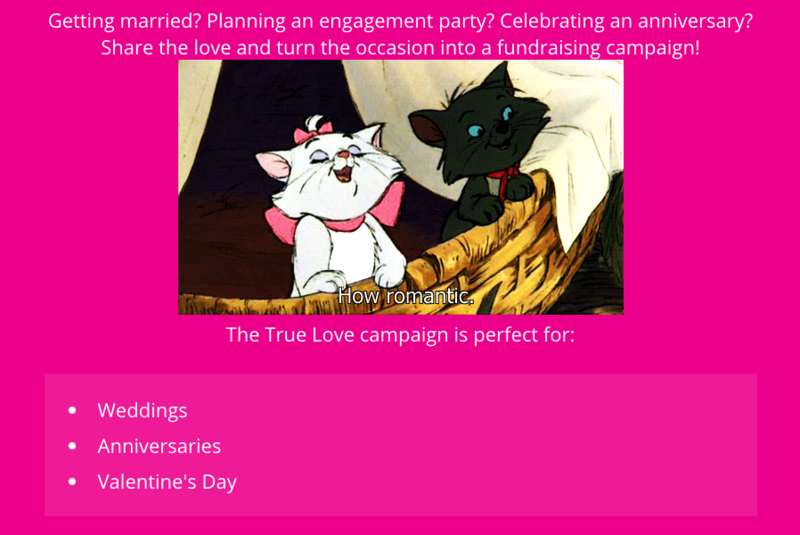 You can also run a campaign dedicated to promoting your year-round fundraising program, and use that to explain that weddings and birthdays are just two of many creative options. True Colors Fund has found that potential donors are more responsive to a positive story or approach, versus a story that “pulls at heartstrings.” They urge fundraisers to keep this in mind as they craft their personal stories. In the same way that you use a soft launch when you roll out a fundraising campaign, True Colors Fund asks their fundraisers to reach out to their close friends and family first. For a bride and groom, the wedding party is a great place to start. After they create some momentum on the page, the rest of their network is more likely to participate and help them reach their goal. The kit also includes social media templates for different channels and sample email appeals the bride and groom can use in place of promoting their gift registry. When you include helpful resources like these for your fundraisers, you lower the barrier to enter and increase their odds of meeting their goals. Ready to offer more options to supporters and kick your year-round fundraising program into high gear? Get started with the guide below.